For the academic journal, see Magnetohydrodynamics (journal). The sun is an MHD system that is not well understood. Magnetohydrodynamics (MHD; also magneto-fluid dynamics or hydro­magnetics) is the study of the magnetic properties and behaviour of electrically conducting fluids. Examples of such magneto­fluids include plasmas, liquid metals, salt water, and electrolytes. The word "magneto­hydro­dynamics" is derived from magneto- meaning magnetic field, hydro- meaning water, and dynamics meaning movement. The field of MHD was initiated by Hannes Alfvén, for which he received the Nobel Prize in Physics in 1970. The fundamental concept behind MHD is that magnetic fields can induce currents in a moving conductive fluid, which in turn polarizes the fluid and reciprocally changes the magnetic field itself. The set of equations that describe MHD are a combination of the Navier–Stokes equations of fluid dynamics and Maxwell’s equations of electro­magnetism. These differential equations must be solved simultaneously, either analytically or numerically. "At last some remarks are made about the transfer of momentum from the Sun to the planets, which is fundamental to the theory (§11). The importance of the magnetohydrodynamic waves in this respect are pointed out." The ebbing salty water flowing past London's Waterloo Bridge interacts with the Earth's magnetic field to produce a potential difference between the two river-banks. Michael Faraday called this effect "magneto-electric induction" and tried this experiment in 1832 but the current was too small to measure with the equipment at the time, and the river bed contributed to short-circuit the signal. However, by a similar process the voltage induced by the tide in the English Channel was measured in 1851. The simplest form of MHD, Ideal MHD, assumes that the fluid has so little resistivity that it can be treated as a perfect conductor. This is the limit of infinite magnetic Reynolds number. In ideal MHD, Lenz's law dictates that the fluid is in a sense tied to the magnetic field lines. To explain, in ideal MHD a small rope-like volume of fluid surrounding a field line will continue to lie along a magnetic field line, even as it is twisted and distorted by fluid flows in the system. This is sometimes referred to as the magnetic field lines being "frozen" in the fluid. The connection between magnetic field lines and fluid in ideal MHD fixes the topology of the magnetic field in the fluid—for example, if a set of magnetic field lines are tied into a knot, then they will remain so as long as the fluid/plasma has negligible resistivity. This difficulty in reconnecting magnetic field lines makes it possible to store energy by moving the fluid or the source of the magnetic field. The energy can then become available if the conditions for ideal MHD break down, allowing magnetic reconnection that releases the stored energy from the magnetic field. The ideal MHD equations consist of the continuity equation, the Cauchy momentum equation, Ampere's Law neglecting displacement current, and a temperature evolution equation. As with any fluid description to a kinetic system, a closure approximation must be applied to highest moment of the particle distribution equation. This is often accomplished with approximations to the heat flux through a condition of adiabaticity or isothermality. The main quantities which characterize the electrically conducting fluid are the bulk plasma velocity field v, the current density J, the mass density ρ, and the plasma pressure p. The flowing electric charge in the plasma is the source of a magnetic field B and electric field E. All quantities generally vary with time t. Vector operator notation will be used, in particular ∇ is gradient, ∇⋅ is divergence, and ∇× is curl. is the ratio of specific heats for an adiabatic equation of state. This energy equation is, of course, only applicable in the absence of shocks or heat conduction as it assumes that the entropy of a fluid element does not change. The plasma is strongly collisional, so that the time scale of collisions is shorter than the other characteristic times in the system, and the particle distributions are therefore close to Maxwellian. The resistivity due to these collisions is small. In particular, the typical magnetic diffusion times over any scale length present in the system must be longer than any time scale of interest. Interest in length scales much longer than the ion skin depth and Larmor radius perpendicular to the field, long enough along the field to ignore Landau damping, and time scales much longer than the ion gyration time (system is smooth and slowly evolving). In an imperfectly conducting fluid the magnetic field can generally move through the fluid following a diffusion law with the resistivity of the plasma serving as a diffusion constant. This means that solutions to the ideal MHD equations are only applicable for a limited time for a region of a given size before diffusion becomes too important to ignore. One can estimate the diffusion time across a solar active region (from collisional resistivity) to be hundreds to thousands of years, much longer than the actual lifetime of a sunspot—so it would seem reasonable to ignore the resistivity. By contrast, a meter-sized volume of seawater has a magnetic diffusion time measured in milliseconds. Even in physical systems – which are large and conductive enough that simple estimates of the Lundquist number suggest that the resistivity can be ignored – resistivity may still be important: many instabilities exist that can increase the effective resistivity of the plasma by factors of more than a billion. The enhanced resistivity is usually the result of the formation of small scale structure like current sheets or fine scale magnetic turbulence, introducing small spatial scales into the system over which ideal MHD is broken and magnetic diffusion can occur quickly. When this happens, magnetic reconnection may occur in the plasma to release stored magnetic energy as waves, bulk mechanical acceleration of material, particle acceleration, and heat. Magnetic reconnection in highly conductive systems is important because it concentrates energy in time and space, so that gentle forces applied to a plasma for long periods of time can cause violent explosions and bursts of radiation. When the fluid cannot be considered as completely conductive, but the other conditions for ideal MHD are satisfied, it is possible to use an extended model called resistive MHD. This includes an extra term in Ohm's Law which models the collisional resistivity. Generally MHD computer simulations are at least somewhat resistive because their computational grid introduces a numerical resistivity. Another limitation of MHD (and fluid theories in general) is that they depend on the assumption that the plasma is strongly collisional (this is the first criterion listed above), so that the time scale of collisions is shorter than the other characteristic times in the system, and the particle distributions are Maxwellian. This is usually not the case in fusion, space and astrophysical plasmas. When this is not the case, or the interest is in smaller spatial scales, it may be necessary to use a kinetic model which properly accounts for the non-Maxwellian shape of the distribution function. However, because MHD is relatively simple and captures many of the important properties of plasma dynamics it is often qualitatively accurate and is therefore often the first model tried. Effects which are essentially kinetic and not captured by fluid models include double layers, Landau damping, a wide range of instabilities, chemical separation in space plasmas and electron runaway. In the case of ultra-high intensity laser interactions, the incredibly short timescales of energy deposition mean that hydrodynamic codes fail to capture the essential physics. In many MHD systems most of the electric current is compressed into thin nearly-two-dimensional ribbons termed current sheets. These can divide the fluid into magnetic domains, inside of which the currents are relatively weak. Current sheets in the solar corona are thought to be between a few meters and a few kilometers in thickness, which is quite thin compared to the magnetic domains (which are thousands to hundreds of thousands of kilometers across). Another example is in the Earth's magnetosphere, where current sheets separate topologically distinct domains, isolating most of the Earth's ionosphere from the solar wind. is the ideal gas sound speed. The plus branch corresponds to the fast-MHD wave mode and the minus branch corresponds to the slow-MHD wave mode. The MHD oscillations will be damped if the fluid is not perfectly conducting but has a finite conductivity, or if viscous effects are present. MHD waves and oscillations are a popular tool for the remote diagnostics of laboratory and astrophysical plasmas, e.g. the corona of the Sun (Coronal seismology). ). This diffusivity leads to a breaking in the magnetic topology; magnetic field lines can 'reconnect' when they collide. Usually this term is small and reconnections can be handled by thinking of them as not dissimilar to shocks; this process has been shown to be important in the Earth-Solar magnetic interactions. Extended MHD describes a class of phenomena in plasmas that are higher order than resistive MHD, but which can adequately be treated with a single fluid description. These include the effects of Hall physics, electron pressure gradients, finite Larmor Radii in the particle gyromotion, and electron inertia. Two-fluid MHD describes plasmas that include a non-negligible Hall electric field. As a result, the electron and ion momenta must be treated separately. This description is more closely tied to Maxwell's equations as an evolution equation for the electric field exists. In 1960, M. J. Lighthill criticized the applicability of ideal or resistive MHD theory for plasmas. It concerned the neglect of the "Hall current term", a frequent simplification made in magnetic fusion theory. Hall-magnetohydrodynamics (HMHD) takes into account this electric field description of magnetohydrodynamics. The most important difference is that in the absence of field line breaking, the magnetic field is tied to the electrons and not to the bulk fluid. Electron Magnetohydrodynamics (EMHD) describes small scales plasmas when electron motion is much faster than the ion one. The main effects are changes in conservation laws, additional resistivity, importance of electron inertia. Many effects of Electron MHD are similar to effects of the Two fluid MHD and the Hall MHD. EMHD is especially important for z-pinch, magnetic reconnection, ion thrusters, and plasma switches. MHD is also often used for collisionless plasmas. In that case the MHD equations are derived from the Vlasov equation. By using a multiscale analysis the (resistive) MHD equations can be reduced to a set of four closed scalar equations. This allows e.g. for more efficient numerical calculations. Beneath the Earth's mantle lies the core, which is made up of two parts: the solid inner core and liquid outer core. Both have significant quantities of iron. The liquid outer core moves in the presence of the magnetic field and eddies are set up into the same due to the Coriolis effect. 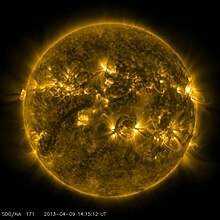 These eddies develop a magnetic field which boosts Earth's original magnetic field—a process which is self-sustaining and is called the geomagnetic dynamo. Some monitoring stations have reported that earthquakes are sometimes preceded by a spike in ultra low frequency (ULF) activity. A remarkable example of this occurred before the 1989 Loma Prieta earthquake in California, although a subsequent study indicates that this was little more than a sensor malfunction. On December 9, 2010, geoscientists announced that the DEMETER satellite observed a dramatic increase in ULF radio waves over Haiti in the month before the magnitude 7.0 Mw 2010 earthquake. Researchers are attempting to learn more about this correlation to find out whether this method can be used as part of an early warning system for earthquakes. MHD applies to astrophysics, including stars, the interplanetary medium (space between the planets), and possibly within the interstellar medium (space between the stars) and jets. Most astrophysical systems are not in local thermal equilibrium, and therefore require an additional kinematic treatment to describe all the phenomena within the system (see Astrophysical plasma). Sunspots are caused by the Sun's magnetic fields, as Joseph Larmor theorized in 1919. The solar wind is also governed by MHD. The differential solar rotation may be the long-term effect of magnetic drag at the poles of the Sun, an MHD phenomenon due to the Parker spiral shape assumed by the extended magnetic field of the Sun. Previously, theories describing the formation of the Sun and planets could not explain how the Sun has 99.87% of the mass, yet only 0.54% of the angular momentum in the solar system. In a closed system such as the cloud of gas and dust from which the Sun was formed, mass and angular momentum are both conserved. That conservation would imply that as the mass concentrated in the center of the cloud to form the Sun, it would spin faster, much like a skater pulling their arms in. The high speed of rotation predicted by early theories would have flung the proto-Sun apart before it could have formed. However, magnetohydrodynamic effects transfer the Sun's angular momentum into the outer solar system, slowing its rotation. Breakdown of ideal MHD (in the form of magnetic reconnection) is known to be the likely cause of solar flares. The magnetic field in a solar active region over a sunspot can store energy that is released suddenly as a burst of motion, X-rays, and radiation when the main current sheet collapses, reconnecting the field. Magnetohydrodynamic sensors are used for precision measurements of angular velocities in inertial navigation systems such as in aerospace engineering. Accuracy improves with the size of the sensor. The sensor is capable of surviving in harsh environments. MHD is related to engineering problems such as plasma confinement, liquid-metal cooling of nuclear reactors, and electromagnetic casting (among others). A magnetohydrodynamic drive or MHD propulsor is a method for propelling seagoing vessels using only electric and magnetic fields with no moving parts, using magnetohydrodynamics. The working principle involves electrification of the propellant (gas or water) which can then be directed by a magnetic field, pushing the vehicle in the opposite direction. Although some working prototypes exist, MHD drives remain impractical. The first prototype of this kind of propulsion was built and tested in 1965 by Steward Way, a professor of mechanical engineering at the University of California, Santa Barbara. Way, on leave from his job at Westinghouse Electric, assigned his senior-year undergraduate students to develop a submarine with this new propulsion system. In the early 1990s, a foundation in Japan (Ship & Ocean Foundation (Minato-ku, Tokyo)) built an experimental boat, the Yamato-1, which used a magnetohydrodynamic drive incorporating a superconductor cooled by liquid helium, and could travel at 15 km/h. MHD power generation fueled by potassium-seeded coal combustion gas showed potential for more efficient energy conversion (the absence of solid moving parts allows operation at higher temperatures), but failed due to cost-prohibitive technical difficulties. One major engineering problem was the failure of the wall of the primary-coal combustion chamber due to abrasion. In microfluidics, MHD is studied as a fluid pump for producing a continuous, nonpulsating flow in a complex microchannel design. MHD can be implemented in the continuous casting process of metals to suppress instabilities and control the flow. Industrial MHD problems can be modeled using the open-source software EOF-Library. Two simulation examples are 3D MHD with a free surface for electromagnetic levitation melting, and liquid metal stirring by rotating permanent magnets. An important task in cancer research is developing more precise methods for delivery of medicine to affected areas. One method involves the binding of medicine to biologically compatible magnetic particles (e.g. ferrofluids), which are guided to the target via careful placement of permanent magnets on the external body. Magnetohydrodynamic equations and finite element analysis are used to study the interaction between the magnetic fluid particles in the bloodstream and the external magnetic field. ^ Alfvén, H (1942). "Existence of electromagnetic-hydrodynamic waves". Nature. 150 (3805): 405–406. Bibcode:1942Natur.150..405A. doi:10.1038/150405d0. ^ Alfvén, H. (1942). "On the cosmogony of the solar system III". Stockholms Observatoriums Annaler. 14: 9.1–9.29. Bibcode:1942StoAn..14....9A. ^ Eric Priest and Terry Forbes, "Magnetic Reconnection: MHD Theory and Applications", Cambridge University Press, First Edition, 2000, pp 25. ^ M. J. Lighthill, "Studies on MHD waves and other anisotropic wave motion," Phil. Trans. Roy. Soc., London, vol. 252A, pp. 397–430, 1960. ^ Witalis, E.A. (1986). "Hall Magnetohydrodynamics and Its Applications to Laboratory and Cosmic Plasma". IEEE Transactions on Plasma Science. PS-14 (6): 842–848. Bibcode:1986ITPS...14..842W. doi:10.1109/TPS.1986.4316632. ^ Kruger, S.E. ; Hegna, C.C. ; Callen, J.D. "Reduced MHD equations for low aspect ratio plasmas" (PDF). University of Wisconsin. Archived from the original (PDF) on 25 September 2015. Retrieved 27 April 2015. ^ Fraser-Smith, Antony C.; Bernardi, A.; McGill, P. R.; Ladd, M. E.; Helliwell, R. A.; Villard, Jr., O. G. (August 1990). "Low-Frequency Magnetic Field Measurements Near the Epicenter of the Ms 7.1 Loma Prieta Earthquake" (PDF). Geophysical Research Letters. 17 (9): 1465–1468. Bibcode:1990GeoRL..17.1465F. doi:10.1029/GL017i009p01465. ISSN 0094-8276. OCLC 1795290. Retrieved December 18, 2010. ^ Thomas, J. N.; Love, J. J.; Johnston, M. J. S. (April 2009). "On the reported magnetic precursor of the 1989 Loma Prieta earthquake". Physics of the Earth and Planetary Interiors. 173 (3–4): 207–215. Bibcode:2009PEPI..173..207T. doi:10.1016/j.pepi.2008.11.014. ^ KentuckyFC (December 9, 2010). "Spacecraft Saw ULF Radio Emissions over Haiti before January Quake". Physics arXiv Blog. Cambridge, Massachusetts: TechnologyReview.com. Retrieved December 18, 2010. Athanasiou, M; Anagnostopoulos, G; Iliopoulos, A; Pavlos, G; David, K (2010). 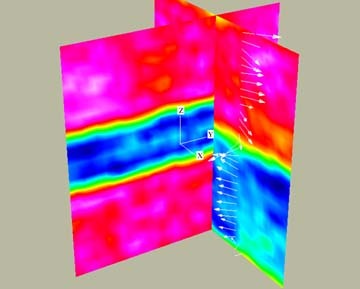 "Enhanced ULF radiation observed by DEMETER two months around the strong 2010 Haiti earthquake". Natural Hazards and Earth System Sciences. 11 (4): 1091. arXiv:1012.1533. Bibcode:2011NHESS..11.1091A. doi:10.5194/nhess-11-1091-2011. ^ Partially Ionized Gases Archived 2008-09-05 at the Wayback Machine, M. Mitchner and Charles H. Kruger, Jr., Mechanical Engineering Department, Stanford University. See Ch. 9 "Magnetohydrodynamic (MHD) Power Generation", pp. 214–230. ^ Nguyen, N.T. ; Wereley, S. (2006). Fundamentals and Applications of Microfluidics. Artech House. ^ Fujisaki, Keisuke (Oct 2000). In-mold electromagnetic stirring in continuous casting. Industry Applications Conference. 4. IEEE. pp. 2591–2598. doi:10.1109/IAS.2000.883188. ^ Kenjeres, S.; Hanjalic, K. (2000). "On the implementation of effects of Lorentz force in turbulence closure models". International Journal of Heat and Fluid Flow. 21 (3): 329–337. doi:10.1016/S0142-727X(00)00017-5. ^ Vencels, Juris; Råback, Peter; Geža, Vadims (2019-01-01). "EOF-Library: Open-source Elmer FEM and OpenFOAM coupler for electromagnetics and fluid dynamics". SoftwareX. 9: 68–72. doi:10.1016/j.softx.2019.01.007. ISSN 2352-7110. ^ Vencels, Juris; Jakovics, Andris; Geza, Vadims (2017). "Simulation of 3D MHD with free surface using Open-Source EOF-Library: levitating liquid metal in an alternating electromagnetic field". Magnetohydrodynamics. 53 (4): 643–652. doi:10.22364/mhd.53.4.5. ISSN 0024-998X. ^ Dzelme, V.; Jakovics, A.; Vencels, J.; Köppen, D.; Baake, E. (2018). "Numerical and experimental study of liquid metal stirring by rotating permanent magnets". IOP Conference Series: Materials Science and Engineering. 424 (1): 012047. Bibcode:2018MS&E..424a2047D. doi:10.1088/1757-899X/424/1/012047. ISSN 1757-899X. Barbu, V.; et al. (2003). "Exact controllability magneto-hydrodynamic equations". Communications on Pure and Applied Mathematics. 56 (6): 732–783. doi:10.1002/cpa.10072. Faraday, M. (1832). "Experimental Researches in Electricity." First Series, Philosophical Transactions of the Royal Society, pp. 125–162. Ferraro, Vincenzo Consolato Antonio and Plumpton, Charles. An Introduction to Magneto-Fluid Mechanics, 2nd ed. Havarneanu, T.; Popa, C.; Sritharan, S. S. (2006). "Exact Internal Controllability for Magneto-Hydrodynamic Equations in Multi-connected Domains". Advances in Differential Equations. 11 (8): 893–929. Hurricane, O. A.; Fong, B. H.; Cowley, S. C. (1997). "Nonlinear magnetohydrodynamic detonation: Part I". Physics of Plasmas. 4 (10): 3565–3580. Bibcode:1997PhPl....4.3565H. doi:10.1063/1.872252. Jordan, R. (1995). "A statistical equilibrium model of coherent structures in magnetohydrodynamics". Nonlinearity. 8 (4): 585–613. Bibcode:1995Nonli...8..585J. doi:10.1088/0951-7715/8/4/007. Archived from the original on 2013-01-13. Kerrebrock, J. L. (1965). "Magnetohydrodynamic Generators with Nonequilibrium Ionization". AIAA Journal. 3 (4): 591–601. Bibcode:1965AIAAJ...3..591.. doi:10.2514/3.2934. Popa, C.; Sritharan, S. S. (2003). "Fluid-magnetic splitting methods for magneto-hydrodynamics". Mathematical Methods and Models in Applied Sciences. 13 (6): 893–917. doi:10.1142/s0218202503002763. Sritharan, S. S. and Sundar, P. (1999) "The stochastic magneto-hydrodynamic system" Infinite Dimensional Analysis, Quantum Probability and Related Topics (e-journal) 2(2): pp. 241–265. Rahimitabar, M. R; Rouhani, S (1996). "Turbulent Two Dimensional Magnetohydrodynamics and Conformal Field Theory". Annals of Physics. 246 (2): 446–458. arXiv:hep-th/9503005. Bibcode:1996AnPhy.246..446R. doi:10.1006/aphy.1996.0033. West, Jonathan; et al. (2002). "Application of magnetohydrodynamic actuation to continuous flow chemistry". Lab on a Chip. 2 (4): 224–230. doi:10.1039/b206756k. PMID 15100815.